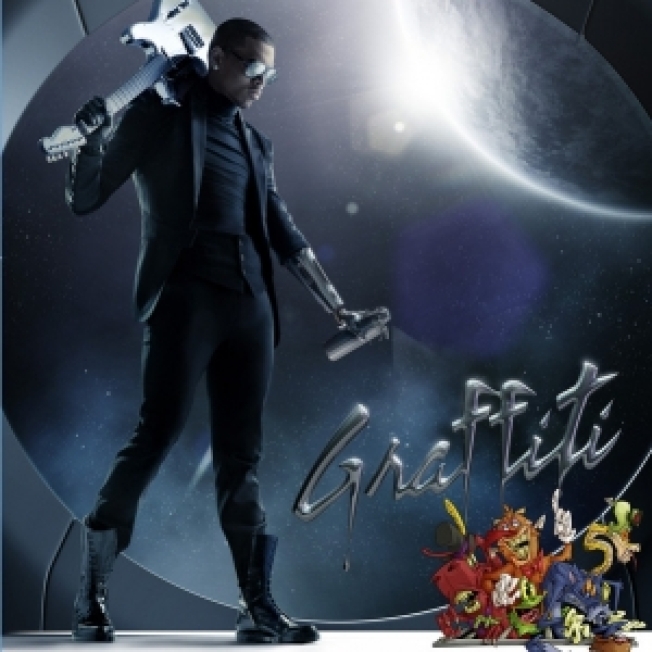 Chris Brown showed off the cover of his new album, "Graffiti" via his Twitter account on Monday. The cover features a spectacle-wearing Brown holding a guitar over his shoulder in a gloved hand, while his other hand – which appears to be part bionic — is holding a spray canister. And in the bottom corner…. Ya know? … Strange cartoon animals (what else?). Brown's new album is due out on December 15 on Jive Records. Also released on Monday were images from Brown's new video, "Crawl," which co-stars singer Cassie in the clip. Brown recently began the roll out of his comeback, performing at the Power 105.1 Powerhouse '09 last month in East Rutherford, New Jersey. In his first major performance since pleading guilty to one count of felony assault against his ex-girlfriend Rihanna in June, Chris reportedly followed openers The-Dream, Fabolous, Day26, Trey Songz, Keri Hilson and Mario with a set that included his new single, "I Can Transform Ya," as well as "Wall To Wall," "Gimme That" and "With You" before closing with "Forever." Chris took the stage in a sparkling red and black outfit reminiscent of his idol Michael Jackson's "Thriller"-era style, seemingly in homage to the late pop star. The set reportedly featured "high-powered dancing," with Chris showing off his moves alongside backing dancers in motorcycle helmets.